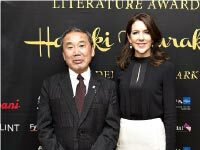 Haruki Murakami is a Japanese writer. He received the H.C. Andersen Literature Award in 2016. 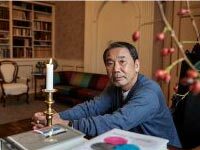 Haruki Murakami claims that he learned to write novels by listening to music, and he refers constantly to the qualities of rhythm, melody, harmony, and free improvisation. His novels are quirky: surrealistic and supernatural, melancholic and fatalistic. They blend myth and modern, magical realism and traditional Japanese tales. He received the H.C. Andersen Literature Award in 2016. Haruki Murakami (born 1949) is a Japanese writer. Both of his parents taught Japanese literature. 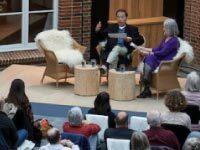 Since childhood, Murakami has been heavily influenced by Western culture, particularly American and Russian music and literature. He grew up reading a wide range of works by European and American writers, such as Franz Kafka, Gustave Flaubert, Charles Dickens, Kurt Vonnegut, Fjodor Dostoyevsky, Richard Brautigan, and Jack Kerouac. These Western influences distinguish Murakami from most other Japanese writers. His fiction has been heavily criticized by Japan’s literary establishment, who view his popular appeal and wealth of references to western culture with suspicion. In addition to his original literary works, he has translated from English into Japanese works by writers ranging from Raymond Carver to J.D. Salinger. His first job was at a record store, like Toru Watanabe, the narrator of Norwegian Wood. Later, Murakami opened a coffee house and jazz bar, which he ran with his wife from 1974 to 1981. At the age of 29, while attending a baseball game in Jingu Stadium, he was struck by the sudden epiphany that he could write a novel. He wrote four novels before Norwegian Wood propelled the barely known Murakami into the spotlight in 1987. His protagonists are almost always caught between the spiritual world and the real world, occupying a position at – or on both sides of – that boundary. He takes liberties with time and consciousness, but nothing is overwrought. Everything is understated. His books and stories have been bestsellers in Japan and internationally. Nine novels, four short story collections, and two works of non-fiction are currently available in English translation. His work has been translated into 50 languages and has sold millions of copies, although the precise number has not been disclosed. He has received numerous awards in Japan and internationally, including the World Fantasy Award (2006), the Frank O’Connor International Short Story Award (2006), the Franz Kafka Prize (2006), and the Jerusalem Prize (2009). 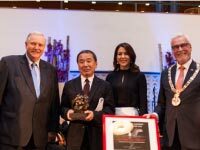 It is a great pleasure for me to receive the Hans Christian Andersen Literature Award. Even in Japan, for well over a century Hans Christian Andersen has been an important writer, widely read, and he has been a major influence in the lives of children. His name alone sparks a special feeling of intimacy. I am very honored to receive an award named after such an illustrious writer. And I am also very grateful to all my Danish readers for faithfully reading my novels for so many years.